Sura (=deva) Mishra (=Brahmin) had an accident while young and as a result is bent over, cannot straighten up and cannot walk easily. He is married with one child. He lives in the family home, which is quite large and beautiful, though it needs a good clean and repainting. It is located on the edge of the village looking onto sugar-cane fields. All this made his contribution the more special: coming from someone who had been injured and who yet has a look of purity about him, humour and good nature. A man came with his daughter who asked a question. Then a lady, then someone called Nandita. Then me. I put the question about worshipping Kālī as consort, then about having the world as my Śakti, and then what practice to engage in. Saumya translated my request. He recorded the answer on his mobile phone, of which the following is the translation. Saumya checked it for its accuracy. In point of fact, it has been very valuable to me so far. “I (Acyutānanda) am very pleased. Here is a question: why does this man, being a foreigner, want to know about our spiritual tradition? If we consider his previous lives and the deeds of the previous lives: he took birth in chaste Hindu families. Before his present birth he lived in Varanasi / Kasi and became the disciple of good and renowned gurus, and practised spiritual austerities, and whatever he gained from those practises he used for the welfare of the world and the wellbeing of people. He was a brahmacārī in his previous births. He tried to analyse many problems and came out with solutions, and after doing some practices of brahmavidyā (the kind of vidyā when you try to be one with Brahma, the Absolute One, explanation by Saumya) he dedicated all his results to the welfare of the world. I am speaking about his previous two past lives. I am Acyutānanda the siddha who is now speaking, Acyutānanda who also taught John in a previous birth. (Sura Mishra himself is amazed at this.) (Acyutānanda continues:) Whatever he has learnt in those previous births, was almost like attaining siddhis. This person took birth in a foreign land, and tried to come to back to his roots, which means that among all those foreigners [who have come here] this person led a spiritual life and tried to revisit his culture. He worked on those areas, trying to do spiritual practices, having Mahākālī as his iṣṭadevatā, just for the realisation and benefit of the world. I am Acyutānanda; I am sitting over 84 yantras, where I see Mahākālī, Mahālakṣmi, and Mahāsaraswatī manifested as Durgā Camuṇḍā. The person’s question is about how to attain Mahākālī and realise her. This is because his past lives’ memory is coming back and trying to force him to be on this path. All this, I say here, reveals that this person has the grace of Mahākālī, or of Jagannath who is considered to be Mahākālī. 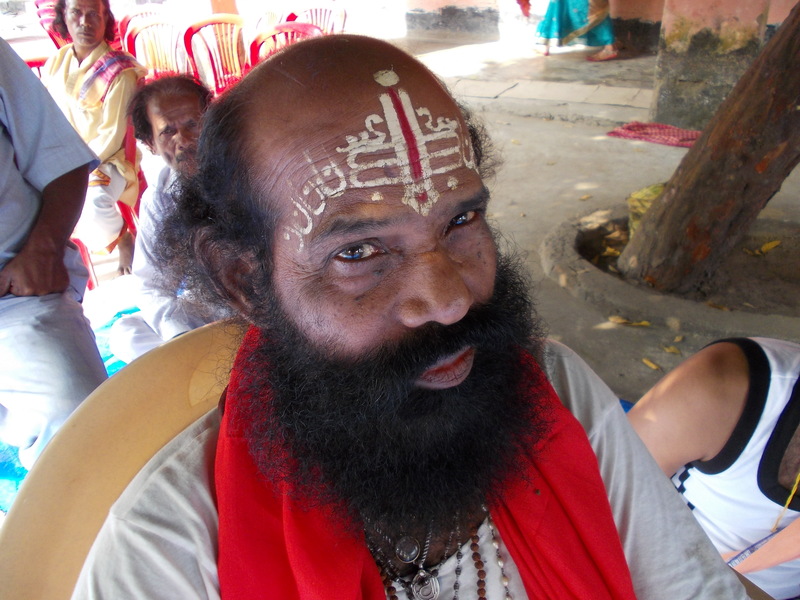 Kālī is Jagannath; they are the same. And the Kālī is Dakinā Kālī, so Jagannath is Kālī or Dakinā Kālī and Balabadhra his brother is Ugratara and Subadha, the sister is Bhubaneśwarī. Then he should recite the Kālika mantra which is Śiva Kālī Śiva Kālī Kālī Kālī Śiva Śiva; Śiva Durge Śiva Durge, Durge Durge Śiva Śiva, for 21 days in the beginning and he will get the blessing of Kālī. After you, John, have recited this for 21 days, come to me and I will tell you what you have realised. Then you must know that with her blessing, there is nothing impossible in this world. Everything will fall into place, and John will be out of three sufferings, which are disease (ruga), torments (soka), and sufferings (duhkha). And the fruits can benefit the world. And so this person, in his mind, has not changed what he was in his previous life. It is still continuing. Considering this, I, Acyutānanda, am giving him another bija mantra which he should again recite for 21 days initially, and then every day after that. But after 21 days he should come back to me. Then I will analyse and reveal many things. Om krim krim krim hring hring hrum hrum dakina kalike, krim krim krim hring hring hrum hrum svaha. And after this visit a Kālī temple. And continue with these practices. With this he will get the desired result. So though you have come from a foreign land I, Acyutānanda, consider you as my countryman and one among us. Acyutānanda is saying this. In Acyutānanda’s court everyone is equal. There is no distinction. So I bless you that you get desired result. May Jagannath or the Mother Goddess fulfil you wishes. Om shanti. Saumya spoke about his experience of recollecting his past lives, one of them in Orissa; the second he was not sure where. There was a third recollection but very fleeting, about being a rajpurohit. He feels that he and I must have been associated in a past life in some way since we share so much in common, he says.